March is the month of the Iditarod race across Alaska, and for any musher who has ever run a team of huskies to Nome, it is a month when flashbacks from races on that thousand-mile trail flit across the imagination at odd moments, day and night. I suppose it is the same for aging jockeys who have ridden a thoroughbred in the Kentucky Derby: a spring day in May, with a glimpse of sunshine on green grass, a mint julep and a fancy hat, or a whiff of horse manure, and on comes a breakneck parade of vividly remembered instants, galloping across the track in the mind’s eye. One race takes a few minutes, the other takes weeks. Both are pageants, with histories, and on the nitty-gritty level they both boil down to quests. Quests for the magical connection that dedicated humans can (sometimes, maybe) make with gifted animals, and the reciprocation of that connection (sometimes, maybe) by those animals. This year the Iditarod start fell on the same Saturday that here at the Hoarfrost I began some dogteam trips with nine university students. I spent the first two weeks of March on the trail north of here, driving dogs every day and making camp every night. By Iditarod racing standards this was a paid holiday. One night, as I tucked myself into my private berth, a 1975-vintage North Face mountain tent, pitched a short distance away from the wall tent full of chattering students, my thoughts drifted to the Iditarod, and specifically to the night we nearly lost Joe Senior, up in the Topkok Hills. Maybe we didn’t nearly lose him, but that is how I always think of it. In 1991, a captivating Alaskan drama played out across the final 77 miles of the Iditarod Trail. A tight pack of front-runners marched, and retreated, in the face of a classic coastal blizzard. Rick Swenson somehow swept forward through the storm to his fifth victory, cementing forever his reputation as one of dog mushing’s great champions. It was a race of trail-breaking, bivouacs, snow, and wind, and as a grand finale the coast of Norton Sound on the Bering Sea dished out its deadly mix of blasting wind and bitter cold. There is a stretch just out of White Mountain, the final checkpoint rest stop before the finish line, where the trail leaves the coast and heads up into the hills. Those hills can generate fierce katabatic winds, and the “Topkok wind tunnel” is a stretch of trail feared by mushers and local residents in such conditions. A wintry Sunday evening in Fort Nelson B.C., just over 500 miles southwest of the Hoarfrost River. My day began there, at home at the Hoarfrost, in the dark at 6 a.m., with a grumpy glance at the clock and another grumpy glance at a thermometer reading 40 below zero. I stoked the fire, made a cup of coffee, attained semi-consciousness, and donned enough layers of clothing for a moonwalk. Headlamp strapped to forehead, and out the door to tug the generator and cords and heaters into position alongside the five-seat Bush Hawk parked on the lake ice. Yanked the generator to life, plugged in three electric heaters, and set them in place to begin their task of warming the engine and cockpit for a flight. This is a four-hour process at that temperature. A ritual familiar to hundreds of northern bush-plane and helicopter pilots, who fly out from bases not connected to that big juicy “grid” of abundantly flowing electrons by which all of modern society seems to live, breathe, work, play, and die. Daylight is coming earlier and earlier, and by the time I next walked to the plane about 8 o’clock, it was light out. What a cheerful change that is from January! At just before 11, Kristen and I took off, flew south ten miles to the dot on the map called Reliance, where we picked up our nearest neighbor and his dog. Richard is off to town for some dental work – he has been in pain and was trying to tough it out, but he’s had enough of that. Kristen has some town chores and visiting to do now, too, having not been into town since just after Christmas. I carried on southwest from Yellowknife, alone, at about 1 p.m. A fast and smooth flight at 8,500 feet, 330 nautical miles straight to the airport here at Fort Nelson, in just over two and a half hours. Put the plane to bed in front of the hangar, its engine heaters tapped into the aforementioned big juicy power grid, called a sleepy taxi driver, and came into town. I write tonight from a familiar room at the Blue Bell Inn, motel plus gas station plus convenience store on the Alaska Highway which forms the main street of Fort Nelson. I have become a regular here in the past year, having now sampled every low-end motel in town over the past 33 years of driving up to Alaska for sled dog races, and since 2006 coming to Fort Nelson for airplane maintenance. The Blue Bell is clean, cheap, and a little old and tired. The managers are friendly enough, and – how to say it? – this place will never be even remotely in the running for five stars. My flight southwest from Yellowknife, on a Sunday, is all about due diligence. The plane has a minor oil leak, and I have been monitoring it over the course of about fifty hours of wildlife survey flying that I just completed. Nothing to panic about, and I am not in a panic, but after every three or four hour flight I lie on my back under the plane and wipe up a little dribble of oil, drooling back from somewhere high and forward in the engine compartment and splattering the clean white metal of the lower cowling’s inner surface. I have spoken with my maintenance people, and they are not alarmed. A seal, maybe affected by the cold. We could have a look, they say. What’s the worst case scenario, I ask. Long pause on the phone. Well, it’s probably just a seal, and nothing major. There are other things it could be. Not likely. We could have a look. This is the edge of one of those grey areas in the flying business. It is a place common to a lot of professional pursuits, where you have to find your own level of comfort and follow your instincts, and consider extra expenses, your responsibility to customers, and do the due diligence. There are no hard and fast rules in this grey realm. Vague mechanical nuisances with airplanes — along with vague nuisances like strong crosswinds, unimproved airstrips, and all manner of marginal weather — go past the textbooks and rule books and bring a pilot into the realm of gut feelings and instinct. You have to decide what you are comfortable with, just as I’m sure a doctor does, a teacher does, mountain guides and mechanics do, ship’s captains, accountants, police officers, and on and on. But – and here’s the big but again – these are flying machines. Gravity is calling them home, as in right now, should something happen forward of the firewall, while out counting moose at 400 feet above the ground, or just slipping the surly bonds of earth enroute to somewhere. In a bigger aviation company, like one I used to fly for in Yellowknife, dealing with an aircraft maintenance concern is a more cut and dried process. The pilot writes up the snag in the airplane’s log book, the maintenance manager notices the write-up at the start of the next shift, someone qualified is tasked with looking into it, and after the assessment the plane is either returned to service or taken out of service for repair. If the machine is taken off line, another plane is substituted for it, usually no trips are cancelled, and life goes on. Hardly ever does anyone wake at night mulling over the prospect of an unpaid roundtrip flight to a warm hangar and a familiar engineer five hundred miles from home base… tossing and turning about if and whether and how and why, and so on, to finally decide and wake in the morning and go heat up the plane and file a plan for the flight. “Aviation in itself is not inherently dangerous. But to an even greater degree than the sea, it is terribly unforgiving of any carelessness, incapacity or neglect.” — Captain A. G. Lamplugh, British Aviation Insurance Group, London. 1930’s. I am sure Captain Lamplugh is long gone, but he would be happy to know how many people have read and pondered those grammatically awkward words of his. The kicker for me is “To an even greater degree than the sea…” For anyone who has ever been scared in a vessel out on big water far from shore, that is a pretty dramatic statement, yet it holds up, when one is strapped into a little chair behind a spinning propeller thousands of feet above terra firma. Then when you have an unexplained minor oil leak in the engine compartment, and you cannot tell quite where the oil is coming from, and the heated hangar run by the people that are familiar with that engine and that airplane and your own standards for maintenance are 500 miles from your home base… you go there. You wait for Monday morning, when they will bring it in from the deep cold, wash the engine down, run it up, find and assess the problem, talk to you about it, and do something to fix it. I suppose that if I had known, all those years ago in Missoula, how my life path would lead me, I would have dropped out and gone to aviation mechanic’s training. Then again, looking around our homestead at the contraptions that I do maintain, and keep running, and keep not replacing because if you twitch this and wire that and so on, the outboard or generator or chainsaw still — sorta, kinda, — runs… well, it is better for everyone that the rules require me to have all my aircraft maintenance done and signed off by licensed professionals who are not overly concerned about our company’s bank account. To cover my bets I have bought myself an airline ticket out of Fort Nelson for day after tomorrow. It is one of the more expensive tickets around, because it allows me to cancel right up to two hours before flight time, or to change the date at no extra charge. That is in case I have to leave the plane here and return home without it. I am hoping not to use that ticket this time around, and instead just go back to Yellowknife, pick up Kristen and Richard sometime on Tuesday, and fly home to continue the work that awaits me there. I hope I can just tuck that unused ticket away for another time. There will surely be another time, if we stay in the business, and keep doing the diligence. Moose, and more precisely moose meat, were much on our mind that morning. Kristen, Liv, and I had spent most of the daylight hours of the previous day roaming on snowshoes, toting rifles, up and down some small drainages east of the Hoarfrost valley, looking for fresh moose tracks. But alas, by the close of the day, we had not looked at any moose. The moose-hunting season in the Northwest Territories ends on the 31st of January. Time was getting a little tight. But we had been here before and there was still a glimmer of hope. It has been very cold here this January, and in between cold snaps the snow has deepened with small incremental snowfalls. Moose do not truly migrate, yet over our many winters here I have noticed that around Christmas or New Years we always start to see more moose sign down in the lower ends of the drainages that fall into McLeod Bay from the north. My pet theory is that as winter’s snow starts to build up and drift into the hollows of the landscape, especially up near the taiga edge and the tree-line, the scattered moose that make their summer homes up there do shift south a few miles to easier movement and better browsing. Every year around Christmas we start to see moose sign again, even if we haven’t seen any at all since mid-autumn. In recent years, when most of the milder part of the hunting season has been spent pounding nails and sawing lumber up at the new house site, or in years when some other work or distraction has disrupted the prime autumn hunting time, the Hail Mary move is to make one last effort for moose meat during January. Sometimes it works. This year we have had a new source for long conversations about our chances of re-filling the meat cache, starting on the day I last posted some writing here, December 30th. That morning Kristen and our two daughters had three dogteams all harnessed for a run up into the hills. I was inside, worshipping the woodstove, and planning to go out with a small dogteam later on. Liv burst through the door, breathless, and said, “there’s a big pack of wolves out on the ice,” and bolted outside again. I grabbed a coat, hat, mitts and binoculars, and hurried out the door. Kristen was pointing toward the lake. Just beyond the rocky island where our windmill stands was the biggest assembly of wolves I have ever seen in one place. There were 22 of them. Most were standing still, some were pacing back and forth; a couple were half-sitting, and several were howling – I could clearly see heads tilted back and even the steam of breath, but their voices were drowned out by the clamor of two dozen huskies all yelping to get going. It was an awesome sight, and I choose that drastically over-used word only when nothing else will serve. Twenty-two wolves, none small, several of them hundred-pounders. I have never seen such a group – the other big packs I have seen have been eighteen, once, thirty years ago, and a few groups of fourteen. The dogteams and mushers all departed on their outing, with a change of route to remain on this side of the river that day. We have seen no sign of that big wolf-pack since that morning. A few days ago there were tracks of a few wolves and a file of musk ox together, on the trail uphill from home. Seeing that enormous group of wolves led us to some long discussions and rudimentary calculations on calories, body size, and predation. It is deep winter and we know, better than most people, what a volume of feed and fat it takes to keep our 34 sled dogs warm and healthy day after day, week after week. If a pack that size stays together for long, they must bring down a sizeable animal – a moose would do nicely, for instance, or better yet a cow-calf pair of moose – every few days, just to sustain themselves. This line of thinking had convinced us that the already long odds of our finding and killing a late-season moose had just dwindled even further. Having seen the competition face to face, it was clearly their game to lose. We could only hope that they had moved out of the area, up toward treeline east or north where there are some caribou herds. Liv and I went out hunting on that wedding-anniversary morning, and Kristen stayed back to await word. We had our open-sight rifles and a limited amount of 30.06 bullets we had re-loaded. First we split up; Liv snowshoed north and I circled around by a different trail to cut for fresh tracks, and then we joined up and drove by skidoo up the Gyrfalcon trail east of the river. I will skip the Field and Stream hunting saga and only say that on that day we were lucky. I make no great claims as a hunter, or as a marksman. In fact my biggest attribute in the field, over the years, has been just dogged perseverance. By mid-day we had a beautiful moose lying dead on the snow, about two miles from home and about a quarter mile off the trail. And as with many aspects of the hunting and gathering life, once the primeval thrill of the chase ended, the work began. The dinner that night, here in the log workshop that has been home since the fire of 2014, was one I will never forget. The table was spread with a fancy tablecloth, the good tableware was out, and the entrees included garden potatoes, boletus mushroom sauce, sourdough garlic bread, and – trumpet fanfare – medallions of moose tenderloin. What put our Hoarfrost River stamp on the night, though, was the ambience of the room out beyond the edges of the elegantly set table. There, five feet from the candles, still dusted with slowly thawing snow from the forty-below night outside, was a big sled piled high with the glistening quarters, ribs, neck, back, and choice inner bits of a butchered moose. A thick brown hide draped over it all. A couple of feet past that sat a big construction-grade generator, two chainsaws, various tools and axes and stained coveralls, and beyond that the makeshift cage where our ancient barn cat Razor – now incontinent – is living out his final days in the warmth of the house. Past that sat another big tub of parts and pieces saved for the dogs, and on top of that a severed moose head, one opaque eye staring upward. And on and on: stacked firewood, buckets of lake water, shelves of canned goods, layers of outer clothing and winter boot parts drying on racks and pegs. A laundry-drying line slung high above it all, festooned with clean undies, socks, long johns, and tea towels. Way up along the north wall, our bed with its sidebars of books and pillows and flashlights… Are you still with me? A decidedly gruesome scene to some, and completely beyond the comprehension of many. And maybe not an elegant dinner setting for the squeamish or the prim and proper, I admit. This is local eating, in this land beyond agriculture. Those mounds of muscle, fat and sinew — those are the miracle, and they are a gift not to be purchased on the shelves of the stores of the world. That frosty pile of meat that will grace our table for many months ahead, a hide that in summer will become smoke-tanned leather, those enormous marrow-bones and racks of fat ribs — all given to us by a fellow denizen of this cold white January world. A moose that spent countless mornings of life standing knee-deep in snow, in dim twilight and wan sunrise, at forty below zero, munching on twigs! The onus is now upon us to stand and be worthy of such a gift. Out there beyond our tiny cluster of warmth and light and buildings, those big packs of real hunters are endlessly on the hunt. I would not want to be on their to-do list. Strong and stealthy, they excel where we blunder. Hunting for meat is their entire life, not just a fleeting facet of it bound by distractions, alternative sources of food, and closed and open seasons. This time we lucked out and snatched the prize they would like to have had for their own. Happy anniversary, sweetie! In bold letters the wrapper on the heavy-duty extension cord proclaimed “Flexible to Minus 50!” The ghost of P.T. Barnum (there’s a sucker born every minute) was smiling as I paused, considered, and tossed that 50-foot cord into my hardware-store shopping cart. Winter flying has begun here, with all its attendant joys of early-morning pitch-dark pre-heats, and — at airports – the need for overnight plug-ins. P.T. would have busted out in a belly laugh a week later when I picked up that same new and utterly stiff cord, and waved a ten-foot length of it around like a physics professor’s lecture pointer. I had to laugh out loud myself, at my gullible stupidity, as I gingerly set it back on the ice beside the plane – at a mere minus 37. The first blast of deep cold always comes like a rude wake-up call, and the call is especially blaring if it arrives after a long, dreamy onset of mild early-winter weather. McLeod Bay somehow managed to freeze on the fairly normal date of December 6, but except for a couple of brief dips down to thirty below, November and December passed in halcyon weeks of above-normal temperatures. On the weather map weak low-pressure systems were gliding slowly past us like enormous holiday cruise ships. Not much snow, not much wind, long walks, twice-a-week hot saunas, pleasant dog mushing despite thin snow on the trails, and easy heating of our motley collection of drafty log buildings. It was the outback early-winter version of the life of Riley. In a place like this, which on dozens of days a year ranks among the coldest places in the northern hemisphere, a round of mild winter weather is a gift to be savored. After all, truly deep cold is nobody’s idea of pleasant weather, is it? Yes, Arctic cold snaps can be beautiful, even exhilarating, but George Gershwin did not write a tune called “Wintertime, and the Livin’ is Easy,” did he? Living and working in minus 35, minus 40, minus 45, and all points between and beyond is tough sledding for our species of mostly hairless, jungle-bred humanoids. The other day one of those luxury-cruise-ship low-pressure systems hauled down its mild-weather flag of convenience, hoisted its true high-pressure colors, dropped anchor just north of here, and lobbed a warning shot of frigid polar air across our bows. Yesterday’s high was 33 below, reached for a few minutes just before the sun slid down. Today the barometer is in a rapid climb yet again, and it is minus 38 out there this morning. Flying the little two-seat Husky to Yellowknife and back yesterday, it was crystal clear, and at 6500 feet above sea level, about a mile above ground, it was a pleasant minus 24: good oil temperature, good cylinder head temperatures, reasonable cabin heat. Gloves off, smooth air, all well. We knew this Capital C Cold was coming, of course. We will adapt, as everyone does, and after this first blast we will just get on with things. I often think of a remark that one of my Iditarod comrades and heroes, Joe Runyan, made years ago, referring to his dogteam at the start line. He said he had “campaigned them heavily” already that season. He had pushed them hard, raced often, and they were tough. Joe was an avid student of military history, and he often let such analogies slip into his discussions of race strategy. That day he was referring to a purposeful but subtle process, something most north-country people can relate to once they have weathered winter’s first blast of deep cold. The first minus-thirty marks the start of an annual long march, and everyone’s feet are a little tender. Within a few days we will bear up and get on with things, cold or no cold. Airplanes will be heated, runways will be plowed, firewood will be carried, and hundreds of miles of ice roads on frozen lakes, winding out to remote communities and mines, will be re-opened. Ease and comfort are going to carry a higher price for some months now. Allowances must be made, and a hundred tiny tricks will be put into play. It is our North, and our Cold, after all, and any living creature immersed in it will either adapt, hibernate, flee, or perish. Within a month or so, when I go out to heat up the plane or run dogs or haul water, at a mere minus 30, that will be kid stuff. By then the first few rounds of 40’s, or even a notable minus 50, will be behind us. Long-abused fingertips will be peeling yet again from frostnip.. An afternoon February high of minus 25 will feel like tee-shirt weather. I was thinking the other day that our common, and perfectly rational, aversion to cold makes for a big PR problem in the effort to inspire action on greenhouse gases. If the dire consequences of our personal and industrial carbon output could only be re-named “Global Deep-Freeze,” instead of the innocuous, even cozy-sounding “warming,” we might collectively shiver — and resolve to act. The jargon is important. Climate Change is a little misleading, as is Global Warming — misleading because if the Gulf Stream’s massive heat pump was disabled by an influx of cold Greenland ice-cap meltwater, northern Europe could wind up with winters more like Reliance and Siberia. Faced with steady news about an impending Mother of all Cold Snaps, I think at least a few of the head-in-the-sand nay-sayers might come around and take a hard look at what is happening. “Cold” – just the word itself — has the power to scare people, but “Warming” needs a lot of explanation before it frightens us. As a society we have become obsessed with warmth and personal comfort, to an extent that would shock our grandparents and great-grandparents. We worship 22 and 72 (to put the temperatures in nice round numbers and in both flavors), as if the attainment of that temperature, year-round, outdoors and indoors, was nothing short of Salvation, Nirvana and Enlightenment all rolled into a single bland, predictable, package. Turn on any media weather forecast, radio or TV, and wait for the announcer to start cooing and ahh-ing about whatever location is enjoying such idyllic temperatures, before wrapping up with a mantra of nanny-state pablum warnings covering Wind Chill, Frostbite, UV exposure, or the Heat Index, whenever the weather veers even slightly from the likes of Santa Barbara or Victoria. Don’t get me wrong. I am a bewildered bundle of contradictions, and I am human, and I have no fur. I adore mild Arctic winter weather, in the range of -15 to -20. My huskies, my ski-planes, and my woodpile like it too. It is just so downright pleasant. Like every northern winter creature since time began, I am a slave to my constant quest for warmth. This morning I sit here and write this, facing the woodstove’s orange glow, in long johns and sweater, wool cap on my head. Outside, the second-to-last morning of the year eases into another full day of deep cold. I need to remember that this is just a first round of Normal, for this place, at this season – nothing more, nothing less. The new extension cord is back in town now, but I seem to have mis-placed the receipt I will need in order to return it for a refund, so I may be stuck with it. I am sure it will find a use around here, either indoors, or in summer. It did provide us with a good laugh on a bitterly cold morning, and a laugh on such mornings is always a welcome thing. Happy New Year to all. Two thousand nineteen! Whodathunkit? Postscript, to my U.S. readers: All temperatures here are in Celsius. And no, I am not going to convert them for you , but I will point out a few reference points: 0⁰ C = 32⁰ F. -40⁰ is -40⁰, and 22⁰ C. is 72⁰ F. 30 below, C. is about 20 below, F.
and I must write a poem to the Emperor. my face stained by wind and smoke. I’ve been “out,” that is, away from home, for the past sixteen days, most of those days at various places in western and northern Canada, and six nights down in what I used to jokingly call The Excited States of America. That old joke is now wearing a little thin, I’m afraid. As are tempers and discretion and polity and a whole lot of other things, both above and below the forty-ninth parallel. And, nope, I haven’t got an intelligent or enlightening word to offer on that topic here, so I will not try. Now I’m home. 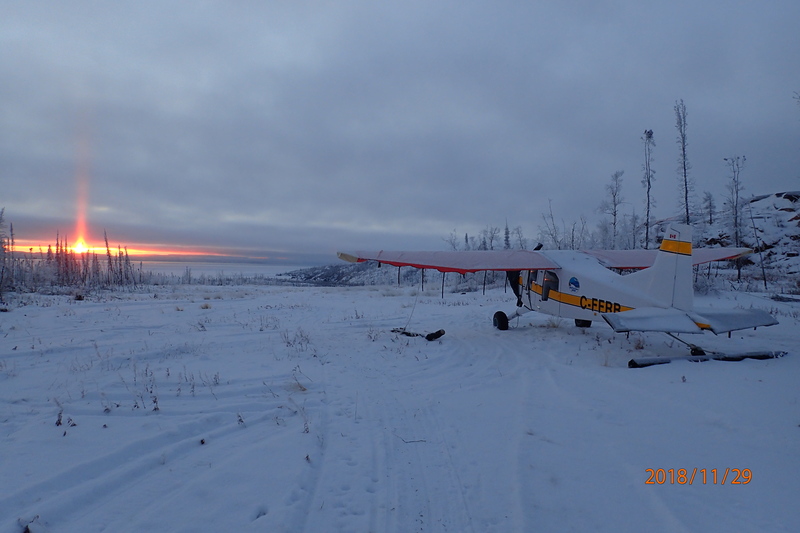 Got home on Monday, touching down in the Bush Hawk on its fat autumn tires, up on the bench of snow-covered sand a mile uphill from our place. I was as tense as usual flying out from Yellowknife, having traded the floats in for tires, yet still aloft over miles of open water, and I was as tense as usual to get the plane down and stopped in the sloping 500-some feet offered by our “airstrip.” As usual, this was not a problem – but if ever I cease getting nervous on short final to a landing up there, that will not be a change for the better. Butterflies and sweat are such wonderful aids to concentration. Once the plane was tied down and blanketed with fabric covers on its wings and cockpit and cowling, and once the chores were done and the dogs were fed (alas, no stars o’er head that night; sorry, Robert Service) I walked to the lakeshore in the deep dusk. There is a humped granite island that juts right out into the bay a hundred yards south of our waterfront. We still call it “the island,” because back in our early years here it truly was an island, but it has been only a rock peninsula (Latin, almost-island) since about 1993, when the lake level started to drop off. A narrow spit of sand connects it to the shoreline, where decades ago we could paddle through with a canoe between shore and island. Across that spit a wire cable is slung on tripods, carrying current from our thousand-watt windmill. The windmill is mounted on a thirty-foot steel pole on the crest of the “island,” and it is highly praised here in these dark windy days of autumn, long after the solar panels have called it quits for about the next four months. I am always happy to come home, but the other night happy to be home does not even come close to what I was feeling. Okay, I’ll come right out and say it. You have my grudging admiration. for me to admire you. I honestly can’t see how you do it. such unruffled patience and resilience. Lately, more and more, I think not. So tell me, friends, how do you do it? How do you cope and juggle and keep it all between the lines? of all that rush and whirr and whiz bang? beeps and chimes and dingalings. And it never seems to faze you! You all just carry on, make small talk, and smile. You’re pleasant. You’re cool, calm, and collected. It’s amazing. Come right down to it, the answer is: I honestly don’t know how you do it. And I don’t know if I could ever learn to do it. This old sled dog just can’t learn all these new tricks. where the rest of you are tonight. while immersed in that rush and whirr and whiz-bang?